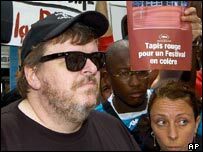 Controversial documentary-maker Michael Moore's intensely political new film, Fahrenheit 9/11, was screened for the world's media at the Cannes Film Festival on Monday. Disney has refused to release this film, other distributors also seem reluctant and - if Moore is to be believed - the White House wants to stop it being seen. The reason is if viewers take the film at face value, they will think George Bush is a fraudulent and possibly corrupt president who went to war in Iraq because of a half-baked motivation of grudge, greed and thirst for power. 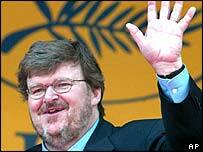 But this is a Michael Moore film and, while that does not mean he is wrong, it must be watched with a critical eye. Moore wants Bush removed from office. He is determined to have this film released before the US presidential election in November for that very reason. The film's conclusions are reached through a mixture of firm evidence, interesting information, moving scenes and tenuous theories. Starting with the presidential election in 2000, it firmly plants the idea that Bush's election - thanks to just 537 votes in Florida - was not exactly free and fair. The first conspiratorial link comes when he identifies the Fox News Channel employee who took the decision to report that Bush had won Florida on election night - when all other channels were reporting an Al Gore win - as Bush's first cousin. If true, it is an interesting piece of trivia - but hardly proof of a family plot to steal the presidency. He introduces 11 September with a blank screen and chilling audio of planes hitting the Twin Towers and the cries of those on the ground. Moore also has footage of Bush sitting in a school classroom, reading a children's book with pupils, for more than 10 minutes after being told the second plane had hit. The film-maker said this full footage had not been seen before because no-one had asked the teachers at the school whether they had captured it on camcorder. One of Moore's chief accusations is Bush allowed planes to pick up 24 members of the Bin Laden family and fly them out of the US in the days following the attacks - when all other aircraft were grounded. To back this up, he shows a document that seems to list them - and uses it as a base from which to explore the relationships between the Bush and Bin Laden dynasties. They go back to Bush's military days, Moore says - and produces military records apparently showing the future president was in the Texas Air National Guard with a man who it says went on to sell a plane to one of Osama Bin Laden's brothers. When Bush was trying to make his way as a Texan oil magnate, this same man was hired by the Bin Ladens to invest their money in Texas, and he in turn invested money in Bush's company, the film says. Moore asserts that prominent Saudis invested in Bush's ailing companies to get access to his father, the former US president. But aside from the original military records, there is little proof to firm up links Moore goes on to make. The result is the oil and arms companies the Saudis invested in, and the Bush family and their inner circle have interests in, profited from the aftermath of 11 September, Moore says. Using a clip of former US head of counter-terrorism Richard Clarke talking about how Bush immediately wanted to find an Iraq link to the attacks, the film moves on to Afghanistan and Iraq. The Afghanistan section - including a screen shot of a BBC News Online story - is a claim that the military action in Afghanistan was really about laying a natural gas pipeline across the country. But the Iraq section is more substantial, and changes the film's direction - using interviews with US soldiers, footage of civilian suffering and highly moving testimony from bereaved parents of US servicemen. The film shows graphic footage of corpses of US soldiers being burnt, dragged behind a truck and strung up, and a scene of US soldiers apparently mistreating Iraqi prisoners. All the while, persuasive army recruiters are followed as they try to sign up young people in Moore's deprived hometown of Flint, Michigan. So Moore went to Washington to try to persuade Congressmen to send their children to Iraq - the son of only one Congressman is in service there, Moore says. Moore himself appears less in this film than he has in his previous documentaries, leaving most of the talking to politicians, soldiers, parents, experts and assorted real Americans. There is highly selective editing, but the story is not totally one-sided. For example, there are soldiers in Iraq who believe in their mission, as well as those who say they are disillusioned. But the movie's conclusions - true or otherwise - and highly emotional interviews with bereaved parents and injured soldiers will have a big impact on audiences around the world.